After going to Anna Vance’s session on Make It Stick, I implemented some of the ideas she presented and thought I found reasonable success with them. However, as I hadn’t read the book, it was a little half-hearted and could be improved. When I was looking through my library’s education e-book collection and saw it there (amidst a sea of worthless looking books, save Other People’s Children, which I also checked out) I decided to pick it up. So my thought became thus: how can I weave this system into my classroom? Here’s my thoughts. I’d love some feedback. Create a system of boxes (folders? tabs?) – I’m envisioning four in a set – for each student. At the end of each lesson, have the class write on (an) index card(s) something from that lesson that they think they should know. (This practice of summarizing their learning is also mentioned in Make It Stick.) It could be a knowledge fact (the definition of a polygon), a skill (solving a linear equation), or something broader (what are some ways systems of linear inequalities are applied?). If it is a skill or broad question, it should not have a specific example. (So they shouldn’t have a card that has them solving 3x + 2 = 8 every time they see it.) Then put those cards in box 1. Their standing HW is to practice whatever is in Box 1 every day. If it says something like “Solve an equation,” they need to generate their own equation, then solve it. (Generation is also mentioned by Make It Stick as a way to increase stickiness.) When they get it right, move it down a box. 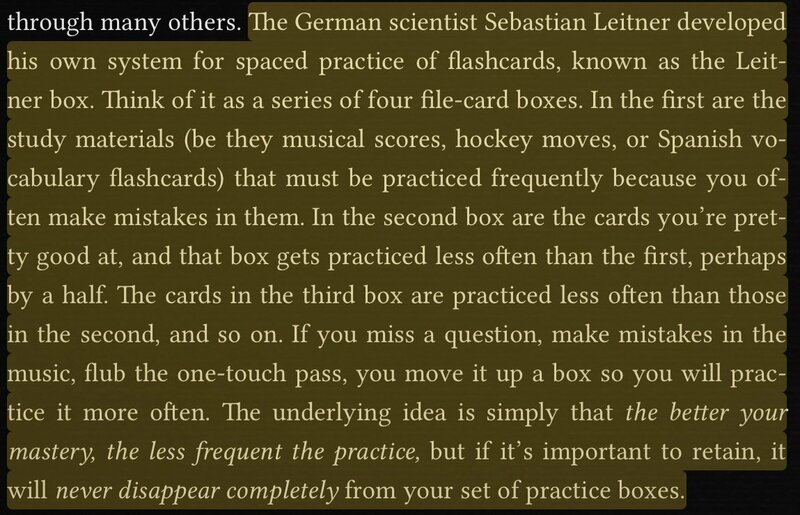 When box 2 is full, practice those the next session, and so on. On Fridays, give some time in class for students to practice, especially their box 2 or 3, if they didn’t have the time to do that at home. Then give the usual quiz. After taking a quiz, they should then reflect on what they did and didn’t know, and if there is something they didn’t know that isn’t on one of their cards, make a card for it right then and put it in box 1. Does that sound feasible? What needs improvement? At the MfA Summer Think, I went to a Teacher’s Poetry Circle. It was pretty great. Below are what I wrote during the two free-write times, slightly edited/punched up. but there are harder things. just at a smaller scale? Maybe “hard” is just a matter of scale. Can we scale up what we do? From the air, you can see everything. A Way to Foster Productive Struggle? My school has been trying to better create conditions for productive struggle in our classes, because a lot of students have taken a very receiving stance. So early in our Area and Volume unit, I decided to use this task from Illustrative Mathematics. The task is a 7th grade task, and so involved nothing new for my high school geometry students – just area and perimeter/circumference. But the task has a lot of parts, not all of which are obvious from looking at it. So I gave them task, and then I was “less helpful.” In fact, I barely spoke during the lesson, only quietly clarifying things, but reflecting their proximity questions back towards themselves and their other group members. Almost every group that attempted the task solved the problem on their own. (I followed up with an extension where they designed their own stained class on the coordinate plane and found the price using the same pricing, for those who finished quickly.) I had a group of three girls who don’t usually feel very confident in my class feel like rock stars after figuring the whole thing out themselves. I thought it really applied here. While the content was still related to what we were learning in high school geometry, the opportunity to solve a complex task with little scaffolding was really helped by using a task from an earlier grade. I recommend it. For previous portfolios in my class, students have asked me how I want them to format their work. Should they write their reflections all on one sheet, or on each assignment? If on one sheet, should get organize by the assignment it refers to, or by the standard? I had said it didn’t matter to me, they could do what they like – and this may have contributed to how hard it was to grade them all. This time I demanded they write the reflections on the assignments themselves (or, at least, on a slip attached to that assignment), and it was so much easier to grade – I didn’t have to flip back and forth between the reflections and the assignment to see if what they wrote was accurate (often it isn’t – they’ll say they did a thing they didn’t actually do). And the few students who didn’t follow directions took so much long to grade. Maybe I shouldn’t have graded them at all – just returned them and had them redo it. So I think I’m going to be stricter about formatting from now on. There are things that are important to have students have a say on in class – but I don’t think this is one of them. A student today told me that I need to have firmer deadlines. “If you did, we’d all do this work earlier. We all do Mr. Ma’s work on time.” The only reason I have firm deadlines at all is because report cards are due. The whole point of my process is revision – but I probably need to work more on developing that cycle. My response, though, was that he was a few months from going to college – he needs to do work even if the deadline seems so far away, or not important, if he wants to succeed. I don’t know if the firmness of my deadlines is good or not. I’ve always gotten the sense that overly firm deadlines discourage students from trying when they realize it’s too late. But maybe they realize they need to try before it’s too late because of them? I dunno. Something to think about. I just got out from seeing Shear Madness, the interactive whodunnit play. (Sorta spoilers, I guess?) In the beginning it seems like a normal sort of play, setting up the characters, revealing the crime, having the detective question the suspects. But then it stops and brings the audience in. The characters do a run through of an earlier scene, but with errors (or lies), and the audience needs to interject when they notice something amiss. During the intermission, they can talk to the detective and suspects for further info, and in Act II can question the suspects directly. The actors, then, have to be very prepared, but also quick on their feet for the unexpected. (They clearly expect some things, as theyhave props prepared, whereas I expect others are move improvisational.) Then they ask the audience where they think the investigation should go, and take it back over for the finally. As I looked at my fellow audience members, when the house lights first came on, they were taken aback by being asked to participate in this way. But then they (we) got really into it. (I had noticed, for example, that during the original scene one of the actors re-entered by a different door than they exited, and was just waiting to point it out.) And the audience didn’t feel like it was fake engagement, with a pre-determined result; they really felt like they had input. As a teacher, seeing that sort of engagement really brought joy to my heart. What does that mean for us teachers? We always have scripts, internal ones if not written ones, but if we invite our students in, really invite them- not just open middles, but open ends – some magic stuff might happen. But it’s hard! You have to be so prepared for so many possibilities, and so quick on your think, and that’s a lot to ask, so many times a week. But maybe try it once. What’s the worst that can happen? Sheer madness? This is the first year I’ve taught seniors. Well, more specifically, seniors who did not need my class to graduate, as I’ve had seniors in algebra and CS before. Whereas my challenge with 9th graders was their maturity level and showing them the norms of behavior in our high school, with the seniors it’s fighting against the (frankly, correct) decision they have made that the work we are doing is kinda unnecessary. This is compounded by the fact that calculus is kinda hard, which makes it easy to disengage. (The APCS class at least had the AP exam as motivation, but now with that past, I have to create a whole month’s worth of motivation.) This probably isn’t helped by the fact that calculus has no set end point that we “need” to get to – we get as far as we get, though I have certain personal goals. So the pace and the effort levels have been low key all year. Now they just want me to pass them all because they are graduating, even though we haven’t even finished the second of three marking periods. So that’s my current struggle.